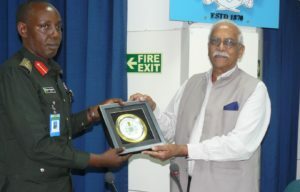 A 39-member Rwanda Defence Force Command and Staff College (RDFCSC) Delegation visited USI on 02 April 2019. The delegation was headed by Col Justus Majyambere, Dy. Commandant & Chief Instructor, RDFCSC. The delegation comprised members from Rwanda, Kenya, Ghana, Uganda, Ethiopia, Tanzania, Zambia, Malawai, Senegal. The welcome remarks were made by Lt Gen P K Singh, PVSM, AVSM (Retd), Director, USI. 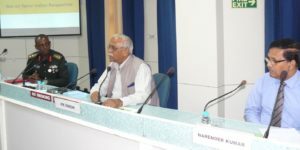 Brig Narender Kumar, SM, VSM (Retd), Distinguished Fellow, USI made a presentation on “Indian Perspective on War on Terror,” where he highlighted the menace of terrorism and its implication for region and Africa. This was followed by a free and frank discussion covering a vast canvas where participants actively participated. Concluding remarks were given by Lt Gen P K Singh, PVSM, AVSM (Retd), Director, USI. The two sides exchanged Mementos after the session.